Today I'm talking about a brand new monthly beauty subscription from Macy's! The Macy's Beauty Box is $15 a month and shipping is free. They do charge tax which I'm not used to so for me in MA, it came to $15.94, so basically $16. 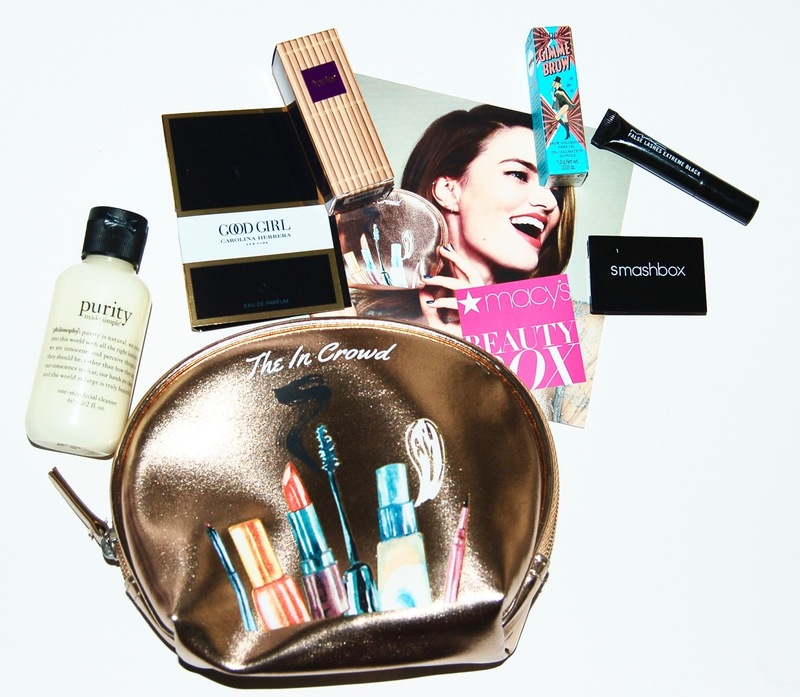 It comes with a makeup pouch, 5 deluxe samples, and a bonus sample. It also comes with a $5 coupon for your next beauty purchase at Macy's. Here is the August box which was the very first one. The makeup bag is really pretty and I will definitely use it! I admit, I rarely, if ever, use the makeup bags I've received in my previous beauty subscription so it was nice to see one I actually liked in this box. Now let's get onto the samples included! This is a really popular cleanser and this sample is decent size. I will definitely use this. This is probably the "bonus item" in this month's box. In fact, like the Play By Sephora box, I bet that Macy's will include a perfume sample in every box as the "bonus item". This is a really nice smelling perfume and I'll definitely use it. This facial oil is a classic. It helps nourish and hydrate the skin. I'll definitely use it when my skin gets dry in the winter. This mascara is supposed to be super black and make it look like you have lash extensions. I certainaly hope so, we'll see when I try it! This is a brow volumizing fiber gel. It has tiny microfibers that will create full looking brows. My brows are plenty full so I don't really need this product. This is a really pretty eyeshadow duo in the shades Turned On and Psyched. While these are pretty shadows, I'm certain I have these shades in the numerous palettes I already own so I'll be passing this product on to someone else. Overall I thought the first Macy's Beauty Box was ok. I have to compare it to the Play By Sephora box because they contain similar brands and sizes of samples. The only thing that makes it better than the Sephora box is the cute makeup bag. I don't like that it's worth $5 more than the Sephora box even though we get the $5 off beauty coupon (which is lame to me because it just means that I have to spend more money at Macy's to get that $5 savings) and I don't think that those extra $5 are worth a cute makeup bag. Truth be told, I saw a spoiler of the contents of this bag several weeks ago and I wasn't impressed because it's more expensive than the Sephora box so I cancelled my subscription weeks ago and I have no intention of resubscribing. What did you think of this subscription box?